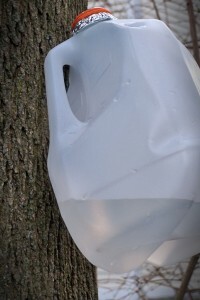 It’s almost time to start tapping our maple trees! March is just around the figurative corner. The days are getting a bit longer, the weather a bit warmer—right? It is, isn’t it?—and with all of that comes maple sugaring season! Last year was our first attempt at the art of maple syrup making. Much was learned—more by error than success—and we are excited to give it another go in 2014. We are waiting for the temperatures to be above freezing in the daytime, and still below freezing overnight. These are the optimum conditions for good sap flow. Thanks to this very cold winter, we’re pretty late in the calendar year for the first steady string of those type of days to begin. But it should start soon. The end of next week, maybe? So we’re gathering supplies (like empty milk jugs to collect the sap, glass containers for the completed product, etc) and we’ll be cleaning the reusable supplies, while also brushing up on the techniques of the process from recommended books and online resources. We have friends “in the business”, so we’ve gathered some tips from them and will be trying a few new things—like not boiling down many dozens of gallons of sap on our kitchen stovetop!—and I am hopeful that this year’s result will be thick, sweet, delicious, golden maple syrup! Do you have a favorite tradition—new or old—that begins with the advent of spring? Are you a “tapper” like us? Hang in there! We’re just a few weeks away!